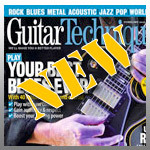 Latest edition of Guitar Techniques magazine is on the shelf at all quality magazineries! This article, which is part three in the Metal Bootcamp Sweeping Technque series looks at the combination of ascending using conventional Sweeping, extending using R/H Tapping, and descending using L/H Tapping! Phew! It’s a combination technique that Tony Macalpine is well known for and the column sets out a progressive routine to help in its development. The lessons moves from the basic triad sounds into 4-note arpeggios and offers some guidance in creating more sophisticated and colourful sounds by superimposing different arpeggios over a static tonality. Includes practice exercises, licks and concepts. Check out Maximum Security (1987), Premonition (1994), and Evolution (1995) by Tony Macalpine. If you’re into Extreme/ Death Metal, then check out the Sweeping and Tapping mastery displayed throughout the album Epitaph (2004),by Necrophagist featuring Muhammed Suicmez and Christian Muenzner. This entry was posted on Wednesday, January 27th, 2010 at 1:16 pm	and is filed under News.